Take a look at PRSA Orlando’s March Newsletter. PRSA Orlando held its annual Professional Development Summit on November 30, 2018 at Rosen Shingle Creek. The event consisted of a keynote speaker and three breakout sessions that were lined up with enthusiastic panelists. The day started with a keynote address by Moira Vetter, who spoke about the importance of entrepreneurial storytelling. Her presentation highlighted the characteristics that set apart entrepreneurs from regular people and how many entrepreneurs have helped to shape the society we live in today. Many entrepreneurs aren’t communications savvy, so they need individuals in public relations to help tell and sell their story. A unique trait that sets entrepreneurs apart from others is their never-ending fighting spirit when facing failure head on. One of the best takeaways of the presentation was how non-entrepreneurs can use their PR skills to help an entrepreneur grow. Moira’s storytelling skills were masterful, as she was able to clearly paint the picture of her presentation in her words. Her presentation truly captured the audiences’ attention. After the keynote address, many of the attendees were able to break out into three different sessions. One of the sessions I found extremely helpful was the “Always in a Hurry” session. This session broke down the importance of proofing and editing in PR as well as in other areas of the workforce. One key takeaway was to always fact check pieces. Many writers misspell names, which are key components to stories. A person’s name is the sweetest sound they will ever hear, and messing that up will ruin a story no matter how insightful it may be. One of the things I used to do when writing was always inserting quotes. The panel taught me to keep facts out of quotes and that they should include something profound or personal about the person it’s attributed to. Another important point that was brought up is that people don’t speak the way things are written. In order to keep things personal, one has to get to know the person they’re writing about. The other breakout session I attended and found interesting was “Owning Your Content.” The session was quite insightful and focused on the importance of style and persona when it comes to PR. One of the ice breakers during the session included a mock brand, where someone had to make up a brand and try to create its messaging. A great example used in the presentation was Wendy’s on Twitter. Wendy’s was highly successful in its sassy snaps back towards other fast food chains, and it got the people going. Many individuals related to Wendy’s because they were able to speak to the minds of what they were actually thinking. Not only was it enlightening, it was also one of the best moves for Wendy’s. It took the company out of Wendy’s and made it a person. One thing about the session I learned is you have to be willing to take risks. Wendy’s had a 50/50 shot regarding whether or not the tactic would work, but the company was willing to place all its eggs in one basket and was willing to try new things. 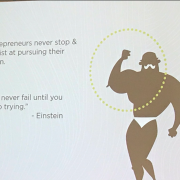 As a junior in college, I found the presentation to be very inspiring. I may not be majoring in public relations, but as a mass communications student, it was very helpful. Not only do I feel more educated on the matter, I feel more confident I will be able to utilize what I learned from the experience in any job field. Many people associate Austin with “keeping it weird,” and while I did happen to come across one or two locals who were a little different, the vibe at the PRSA 2018 International Conference was anything but weird. In fact, if I had to sum it up in one word, it would be inspiring. I must thank the Orlando chapter for providing me with a scholarship to attend. As an independent practitioner, expenses surrounding a conference of this scope and magnitude can sometimes feel a bit out of reach. But thanks to the scholarship, I was able to see and hear from some of the most interesting public relations and marketing minds around the globe. Leaving ICON, I felt energized and ready to take on new challenges for my current and future clients. The overarching theme of this year’s conference was communications convergence, and it’s a concept I’m sure most of us grapple with from time to time. What really constitutes a journalist nowadays? What is considered real news and what isn’t? I can tell you that there were several encouraging statements I heard from those in PRSA leadership at the national level that made me feel well-represented and defended. There are people in some of the highest positions of our organization that are consistently going to bat for PR professionals who may feel embattled or tired of having to fight against the notion that we provide ‘fake’ news on behalf of our clients. I was also encouraged to hear that leadership is turning its attention to the value that PRSA’s sections provide members; as a section leader myself, I have witnessed first-hand how important it can be to meet – even if it is virtually – with others who are in similar roles to brainstorm ideas, discuss hurdles, and even partner from time to time. One of the most exciting pieces of news I heard during the conference was that ICON will be held in beautiful, sunny climates for at least the next two years. San Diego is next up in 2019, and, believe it or not… ORLANDO is slated to play host in 2020. As you well know, a lot can happen in any given profession in two years’ time, and given our current political climate and the fact that Orlando’s 2020 ICON will be held right before a presidential election, I think we’ve got a great opportunity to showcase just how critical public relations professionals are when it comes to leading both a national, and international, narrative. Leaving Austin, I was grateful for the opportunity to reconnect with some old friends and to meet some new ones, and I was especially appreciative of the opportunity to learn from some of the best and brightest in this business. I’m excited to put what I learned into action in the weeks and months ahead, and look forward to what I’ll most certainly learn in San Diego, Orlando, and beyond. Thank you again, PRSA Orlando, for the scholarship and for the opportunity to represent our great chapter in another really great city. Every three years, accredited professionals must maintain their credential and commitment to the sound and ethical practice of public relations. One of the ways you can reach your maintenance goals is by publishing on the topic of public relations, including a blog post on our PRSA Orlando website. APRs will receive 2 points for each well-thought article, op-ed, book review, blog post, podcast, or video published in a public relations journal, magazine, newspaper, newsletter, in print or electronic format. As if jumping off a cliff attached to a large elastic rope wasn’t risky enough, Will Smith decided to celebrate his 50th birthday by bungee jumping out of a helicopter. Yes, you read that right. His jump was an answer to a challenge made by founders of the YouTube channel Yes Theory, who believe life can be authentic and fulfilling if you seek discomfort. Let me be the first to say that even though I was nowhere near the Grand Canyon when Smith jumped, I was 100 percent uncomfortable. By now, you’ve probably guessed that the title of this blog is clearly a hyperbole. I will not, nor do I recommend that you heli-bungee jump (unless your heart desires). But in all seriousness, I do believe there’s something that public relations professionals can learn from Smith’s daring birthday celebration. First: step outside of your comfort zone. As PR practitioners, while we maintain many principles that serve as the foundation for our industry (i.e., advocacy, honesty, ethics, etc. ), we can’t deny the role technology plays in how our audiences disseminate and receive information. Take for instance, Will Smith and his jump. He not only accepted the challenge of YouTubers, he chose the non-traditional route, which racked up more than 16 millions views by streaming it live on said platform. What does this have to do with PR? Many of us are comfortable with traditional media. We may have even mastered the art of working with bloggers and influencers. But with Will Smith bringing vlogging to Hollywood, we continue to see more people taking hold of their content and sharing it on their own terms. It’s not always easy to adapt to changes in technology, particularly for larger organizations, but since when has innovation been related to the status quo? The next lesson I believe we can all learn is to lead with authenticity. Our audiences can tell when we’re trying to do something that doesn’t fit our organization’s personality. Everyone can’t be as straightforward as Gary Vee, or as socially conscious as Google, or as witty as Wendy’s (the restaurant, not me). At the end of the day, it’s up to us as communicators to help our organizations/clients navigate the ever-changing technological landscape ― while also helping them maintain a true representation of their corporate identity. Does that mean you need to bungee jump out of a helicopter and stream it live? No. But it is worth watching if you haven’t seen it yet. 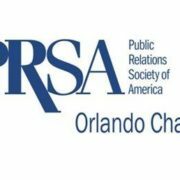 Take a look at PRSA Orlando’s August Newsletter. We’ve got a hot offer for new members – use promo code SUMMER18* on your membership application before August 31 and receive a $25 Amazon gift card and waived initiation fee ($65). 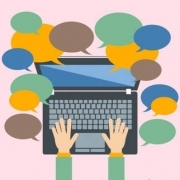 24/7 access to the members-only MyPRSA online community. Share insights and ask questions of your fellow PR and communications professionals while elevating your thought leadership profile. Member discount program for a wide variety of goods and services. Discounted registration to a wealth of training programs and webinars. The PRSA Membership App gives members access to the latest PRSA publications, including Issues & Trends, top-rated webinars, PRSA’s online community and membership directory. Opportunities to network with more than 21,000 communication and public relations professionals. Subscription to the NEW industry-specific publication, PRSA Strategies & Tactics. Summer is a perfect time to relax and reconnect with Central Florida colleagues. So take advantage and join today! *Offer is valid for persons joining at the Member and Associate Member 3 levels. Not valid for current members, renewing members, PRSSA Graduates, Graduate Students, Associate Members at levels 1 or 2. Refer to https://www.prsa.org/membership/membership-categories for details. June 12 marked two years since the Pulse nightclub tragedy in Orlando. 49 beautiful lives were taken senselessly. Through the heartbreak, our city has since become more unified in its strong voice for diversity and inclusion because of who we are and who we represent. But when remembering this tragic incident and many others along the way, it’s hard not to be reminded of how much hate still exists in the world. That being said, while we can’t raise a magic wand this minute, we can do our part to build a greater immunity to hate and be more representative of diversity by deliberately being inclusive within our companies, our associations, and our own daily lives. Just check out this list of 26 companies who celebrate diversity all year long. These companies are LIVING their differences, not just preaching it. Embracing all types of people, ridding the norms, and seeing a good person as a good person are what help shape D&I for all members of society. 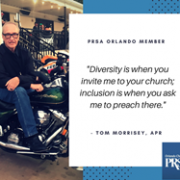 Recently our PRSA Orlando chapter board of directors decided we wanted to make a statement to our members that reflects our chapter on diversity and inclusion in addition to PRSA’s national defined role. After some brainstorming, we quickly realized….ONE STATEMENT? That’s like trying to sum up 200+ resumes on one Post-it note. Rather than providing one local statement that represents our chapter, we decided to reach out to our members to gather their own thoughts directly about D&I and use it to enforce our policies more authentically. Because like true practice, we should always incorporate our members into the discussion. Taking time from our busy schedules to refresh and renew with peers opens us to new ideas, advice and problem-solving assistance, according to Francesca Gino, a professor at Harvard Business School in a recent article on HBR.org. During my 13 years as a member and volunteer, PRSA has provided me with just that through opportunities to meet communicators in my field and the industries where I’ve worked. These professional relationships are both fulfilling and enlightening and have made me a believer in the link between networking and career success. That’s why I encourage professionals in PR, marketing, and communications to join us. 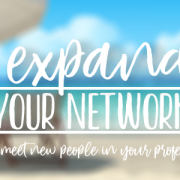 This year PRSA is making it even easier to share the benefits of our chapter and national organization with several 2018 promotions that welcome new and returning members to PRSA. Score a thank you gift and help a colleague save on membership dues during the Refer-A-Friend promotion. Members receive a $40 Amazon gift card for each new person who joins PRSA and lists your name as a referral on the application form (How did you hear about PRSA). PRSA will also waive your friend’s $65 initiation fee if they use the promo code FRIENDS18. Applies to Member (3+ years experience) and Associate Member 3 (2-3 years experience) levels only. Know a lapsed PRSA member? Let them know former members can use the promo code WELCOMEBACK18 and PRSA will waive their $35 reinstatement fee. Applies to memberships lapsed 6 or more months. Anyone applying as a new member can use the promo code JOINPRSA18 and the $65 initiation fee will be waived. Applies to Member (3+ years experience) and Associate Member 3 (2-3 years experience) levels only. All promotions are valid through Dec 31, 2018. Learn more about PRSA membership benefits, chapters, and professional interest communities at https://www.prsa.org/membership/. Have questions? Please email Beth Swanson, Co-VP Membership Recruitment at beth@swansoncomm.com. 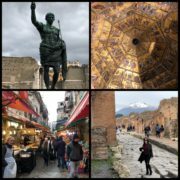 Over the holidays I traveled to three different countries – all of which I didn’t speak the native language, but learned a few key phrases to help me communicate throughout the day. What I quickly realized, though, was even though I could speak “enough,” the language didn’t actually help me as significantly as I thought it would. Instead, while trying to speak my message, there were follow up questions I couldn’t understand. So, without even thinking, my reaction was to respond with my hands and animate nonverbal cues to communicate more fully. In turn, the others responded the same way, and we actually had a short conversation that came to the point naturally, and without even speaking to each other. This nonverbal communication helped me through three language barriers, so much that I didn’t feel like I was at a disadvantage not knowing the native tongue. It’s amazing how through simply using your hands and expressing emotion through your face to set the tone spoke more loudly than “il conto per favore,” which plainly means, “may you please bring the bill?” I added in nonverbal signs for how the food was great and that we were pleased and ready to go. Of course, there are cultural differences among nations that prove some nonverbal behaviors vary in their message, but for this example let’s put that aside and instead focus on the fact that those of different nations are still human beings. Good communication carries strongly all over the world. In 79 AD, on the southwest coast of Italy, the extremely dangerous volcano, Mount Vesuvius, explosively erupted over the city of Pompeii. All those residing there died instantly of thermal shock. Back then (and for thousands of years), settlements painted and drew pictures on the walls of their city and homes to depict expression. Even though we lost the chance to learn about the people of Pompeii through written language, we’ve learned about them through their paintings. When viewing just one, we see a narrative and several learnings of how they lived. These stories are told without words, yet we can interpret the message of what they mean just by focusing on the details of the painting. Pretty remarkable. So what does this mean to me—to you? This is more than the lesson of “nonverbal communication is still communication.” This trip and these type of experiences actually instead remind me to not overthink things when working in communications among different audiences. Simple pictorial or nonverbal communications speak loudly. Getting to the point is the most important part, and be aware of facial expressions that set the tone of your messages. Nonverbal signals speak loudly to those of all backgrounds, so never underestimate your ability to communicate effectively and authentically to those who are different than you.